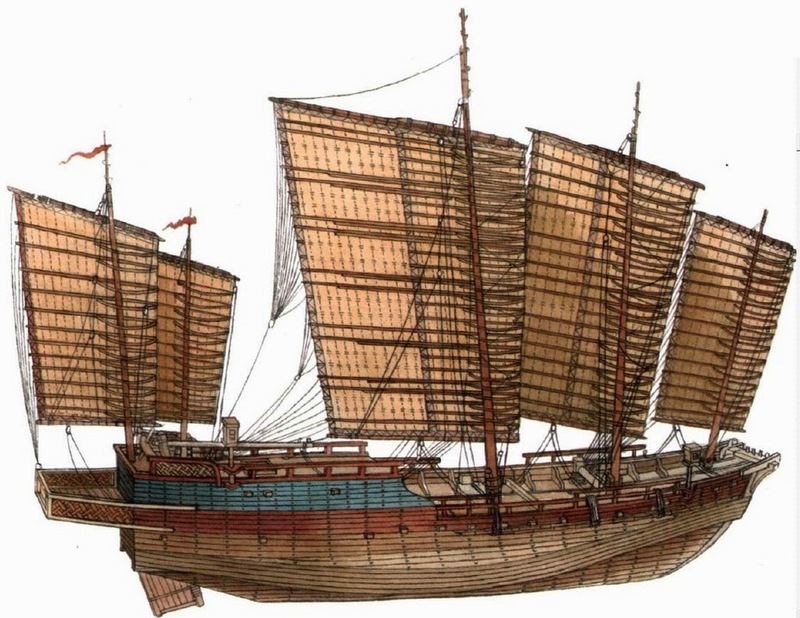 13th Century Mongol Multi-masted Oceanic Junk. Japanese junks differed somewhat from the junks of China, since it was necessary to sail among the islands of Japanese archipelago where the large flat-bottomed Chinese vessels would find it difficult to maneuver in the rough seas. 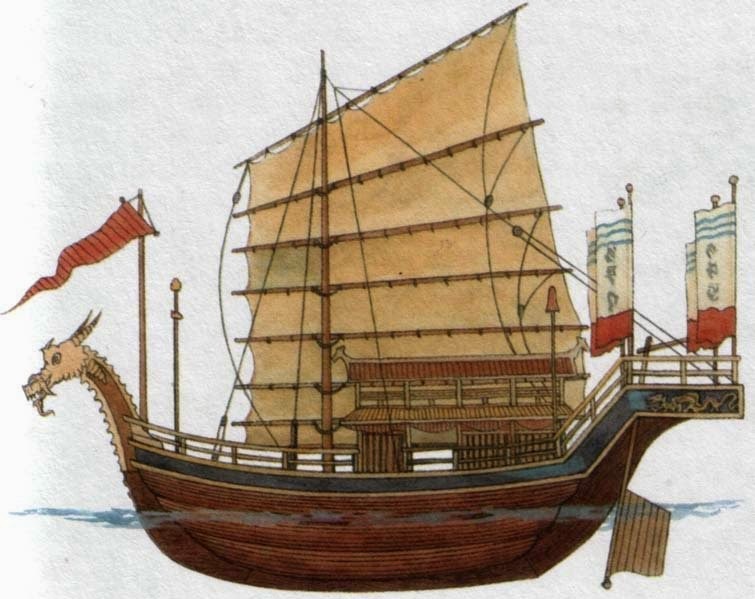 Similar ships to this one were equipped as warships and composed the fleet of the Mongol emperor of China Kublai-Khan. So in the 13th century a 1000 sea junks with 100 000 soldiers aboard were sent to invade the Japanese archipelago. If this fleet had not been destroyed by a powerful typhoons (Kamikaze-Divine Wind), then the history of these countries would have changed dramatically. The Kamikaze (Japanese for divine wind), were a pair or series of typhoons that are said to have saved Japan from two Mongol fleets under Kublai Khan that attacked Japan in 1274 and again in 1281. The latter is said to have been the largest attempted naval invasion in history whose scale was only recently eclipsed in modern times by the D-Day invasion of allied forces into Normandy in 1944. The first invasion devastated the Japanese. The battle took place on the beaches where the two forces met. The Mongols had several advantages; The Japanese were overwhelmed and began to retreat. Not knowing they had won, the Mongols feared the Japanese were coming back with reinforcements and also retreated. During the time period between the first and second invasion, the Japanese built walls to protect themselves from future invaders. Seven years later, the Mongols returned. They found themselves unable to find any suitable landing beaches due to the walls. The fleet stayed afloat for months as they depleted their supplies and searched for an area to land. 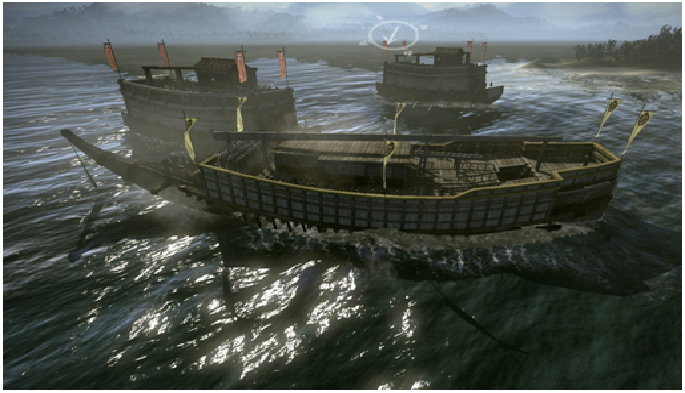 After months of being exposed to the elements, the fleet was destroyed by a great typhoon. The Japanese called it Kamikaze. The Mongols never returned. The Japanese were saved by the walls they had built and nature's fury. In popular Japanese myths at the time, the god Raijin was the god who turned the storms against the Mongols. Other variations say that the god Fūjin or Ryūjin caused the destructive kamikaze. * Many of the ships were requisitioned river craft with flat bottoms and wobbly masts, and thus unstable in rough sea. * Some of the ships had been poorly made, perhaps as the result of deliberate sabotage by Chinese shipbuilders who resented their Mongol conquerors. 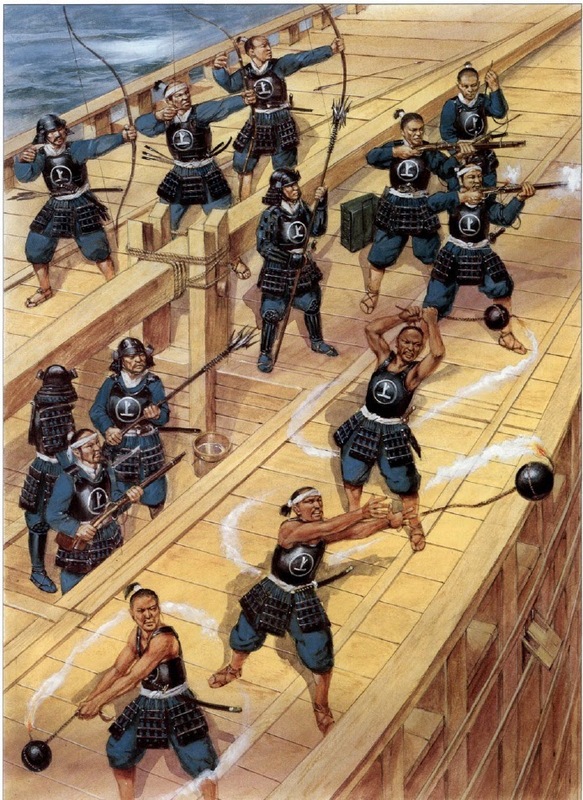 This plate shows the kaizoku pirates of the Murakami navy at the height of their powers when they were in action against Oda Nobunaga at the first battle of Kizugawaguchi in 1576. They are more substantially dressed and armed than the wako who raid China and Korea. Their bodies are protected by simple okegawa-do-style armours as worn by the ashigaru (footsoldiers). The mon (family badge) of the Murakami is lacquered on to the breastplates and they also wear simple shirts and trousers, bare feet in straw sandals, although the energetic bomb hurlers have stripped right down. They are flinging horoku, which consisted of two iron hemispheres fastened together and wrapped round with layers of washi (Japanese paper) glued on to the outside surface. Gunpowder and numerous iron shards were held inside, reached by a fuse timed by its length, while a rope or cord was attached to the outside for throwing in the manner of an Olympic hammer thrower. The weapons used by their comrades include arquebuses and bows, together with the 'sleeve entangler', associated with the police of the Edo Period; a mass of spikes constituted the head of this polearm, and about 20cm (8in.) of its upper shaft was also covered with spikes. The two Battles of Kizugawaguchi were fought during Oda Nobunaga's attempted sieges of the Ishiyama Hongan-ji in Osaka. The Hongan-ji was the primary fortress of the Ikkō-ikki, mobs of warrior monks, priests, and farmers who opposed Oda's rule. He ordered one of his admirals, Kuki Yoshitaka, to organize a blockade against the fleets of the Ikki's allies, who sought to supply the fortress and break the siege. Many of the ruling families of the neighboring provinces opposed Oda, chief among them the Mōri clan. In the first battle, in 1576, the Mōri defeated Kuki Yoshitaka's fleet, breaking the blockade and supplying the fortress. Both sides fought with firearms, a rather new development in Japanese warfare; but Mōri's experience and knowledge of naval tactics was ultimately the deciding factor. Two years later, the Ishiyama Hongan-ji was still under siege, and Oda's fleet, commanded once again by Kuki Yoshitaka, made another attempt to break the Mōri supply lines. Going against convention, Yoshitaka fought with six very large ō-adakebune ships, rather than a combination of small (kobaya), medium (sekibune), and large (adakebune) craft. 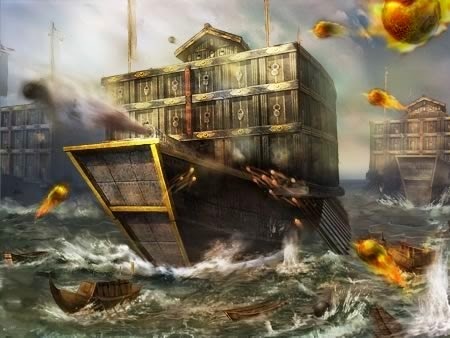 Normally, adakebune were essentially wooden floating fortresses, covered in gun and bow emplacements. According to some accounts, it may be believed that these six were the first ironclads, and were built such that guns could not penetrate them. However, rather than true ironclads, made primarily or entirely of metal, these craft probably simply had limited iron plating in key locations. Several Mōri vessels were burned and sunk, and Oda's fleet ultimately achieved victory. The supply lines were broken, and the Hongan-ji fell soon afterwards. However, during this battle an interesting flaw was discovered in the ō-adakebune design. As Mōri samurai rushed to board the large ship, all the defending warriors ran to that side of the deck, to defend themselves, and the ship capsized as its center of gravity shifted. Yoshitaka went on to defeat the Mōri once more the following year. The Cheops ship, the oldest preserved ship from antiquity, was found in 1954 close to the Great Pyramid in Egypt. It is built almost entirely of imported cedar. The ship was clearly a ceremonial vessel, yet compression marks of rope show that it was definitely used in the water. Dating from 2500 Be, the 'shell-first' design of the Cheops ship shows that the hull was shaped before the internal members were added. It has no keel, and the side planking is lashed with rope for security. Built as a ceremonial vessel, rope compression marks show that it was used on water. Two cabins stand on the ship's deck, the two-roomed main one covered by a canopy for added coolness. The ship was equipped with oars plus steering oars. Contemporary Egyptian warships were of similar construction. In 1954 two intact Egyptian ships were found at the foot of the Great Pyramid. 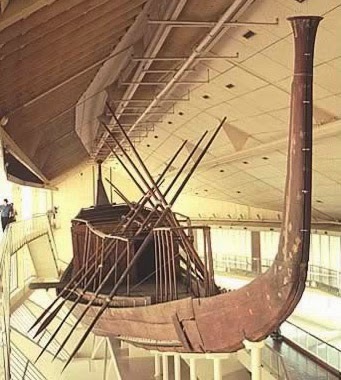 Around 2600 BC, during the Old Kingdom, the two planked ships were dismantled and buried in two pits, just outside the great pyramid of Pharaoh Cheops (Khufu). Each pit is 30 m long, carved in the rock and covered with a lid of large stone blocks. Cheops 1 was assembled 1969-71 and is on public display at the Cheops pyramid outside Cairo, where a museum building was created for the ship in 1982. The pit believed to contain the second ship, Cheops 2, is still not excavated, but there are plans to open the pit and assemble that ship in the future, when there is enough experience from the treatment of the first ship. The pits were found intact and all pieces of the first ship carefully recovered. The ships are nowdays known as the "Cheops ships", "Khufu ships", "Solar ships" or "Cheops boats". They may have been the private ships of the pharaoh, buried in the pyramid. The ark was the vehicle God used to deliver Noah, his family and the animals from the flood (God's judgement). Most people are familiar with popular artistic depictions of Noah’s Ark. The ark often resembles a wooden ship with a barn-like structure on top. Interestingly, the Bible gives a much different description of the ark. The book of Genesis describes it as a rectangular object resembling a barge rather than a ship-like structure. The basic specifications for the ark are given in Genesis 6:14 - 16. Noah is commanded by God to construct the ark. Therefore, the specifications came from God Himself. Genesis 6:14 - 16 (NKJV) 14 "Make yourself an ark of gopherwood; make rooms in the ark, and cover it inside and outside with pitch. 15 "And this is how you shall make it: The length of the ark shall be three hundred cubits, its width fifty cubits, and its height thirty cubits. 16 "You shall make a window for the ark, and you shall finish it to a cubit from above; and set the door of the ark in its side. You shall make it with lower, second, and third decks. What Was the Hull Shape of Noah’s Ark? The Genesis passage provides only a brief description of the ark's basic specifications. These specifications appear to represent a rectangular hull design. However, it is possible that the ark's design could represent a more traditional hull shape. Since detailed construction plans are omitted, we don't know for certain what the hull shape actually was. Moses is the credited author of Genesis. He may have condensed a much longer story in order to conserve space or perhaps the only information he had available was what he included. Therefore, all we have available for the ark's design is what is written in Genesis. It is likely that the Genesis account of the Great Flood came from earlier written material. We know Moses was educated in Egypt. Perhaps he learned about the flood from the libraries of the Egyptians. Perhaps their ancient libraries contained detailed knowledge on the antediluvian society that lived before the flood. Another likely possibility is Jacob could have carried records into Egypt that were kept by both the Israelites and the Egyptians. It is entirely possible that the Genesis story could have consisted of a number of writings which Moses condensed into "Genesis". Perhaps the information could have come from an ancient "Book of Noah", containing a more detailed version of the Genesis story. The ark's purpose was to deliver its occupants from a catastrophe that would bring an end to all land based-life on earth. The Biblical word for ark is "tebah" and it is used only in the Genesis account of the flood and for the container in which Moses was placed. The ark's design was intended to protect its occupants from the hostile environment of the flood. Its construction appears to have taken about 120 years. Interestingly, it appears to have been designed without capability for steerage or power. This was probably due to the reason that there was no place to navigate to during the flood. Navigation would have been at the mercy of God. The Bible also indicates that God watched over the ark. The ark was made of a material that the Bible identifies as "gopher wood". The actual Hebrew word is "Gopher". The exact meaning of this material is still unknown. It has been presumed by some to be Cypress wood, Cedar, Teak, or Mahogany, but these are only assumptions. What ever the actual material was, still remains a mystery, although it was probably some type of wood. There are serious problems with building a solid wooden ship longer than 300 feet. This is due to the structural stress caused by the effects of wave action upon wooden vessels. Gopher could have been a material which was far stronger than conventional wood. The Antediluvians may have had processes for strengthening wood that we are not aware of. It is interesting that no ship of the size of Noah’s Ark was built until the late 19th century when iron was used for construction material. It is possible that other materials could have been used in its construction. Perhaps metal was used as a frame (which is not mentioned in the Bible). Another possibility is the design could be other than the rectangular shape given in scripture. The outside and inside were coated with pitch. The Hebrew word is "kopher" and again, this word is obscure so we don’t know what the composition of the pitch was. Pitch was probably used to make the ark water tight and to protect the exterior from the effects of the outside environment. The ark had three decks. We don’t know if they were all the same height or if there were areas in which there was open space from bottom to top. The ark had only one door, which was the side door (Gen 6:16). It was used for loading its cargo. Genesis also describes a window that is 1 cubit in size (Gen 6:16) (~18 inches) located at the top of the ark. The size in this description makes it (likely) to be a small hatch. We are not entirely certain of the exact use of the window. We do know that Noah was able to send out the raven and the dove, probably from this same window. It is a safe assumption that the ark needed some sort of ventilation. This could have been one purpose of the "window". Elfred Lee's painting shown at the top of the page, shows a row of these "windows" along the top of the ark extending from bow to stern. This would form an adequate ventilation system. With its cargo of animals, it would seem necessary to have more than one eighteen-inch window for ventilation. The measurements provided in Genesis are in cubits rather than feet or meters. A cubit in the Old Testament is approximately 17.5 inches long. Another measurement to consider is the Egyptian Royal cubit which is 20.65 inches. As mentioned earlier, Moses is credited as being the author of Genesis. Since Moses was educated in Egypt we should consider the Egyptian cubit, as well as the Hebrew cubit. Hebrew common cubit = 17.5 in. Egyptian Royal cubit = 20.65 in. The ark has the same cargo capacity of a modern cargo ship. The above figure shows a comparison with a 550 ft long cargo ship. The ark had a volume of 1.4 million cubic feet and a gross tonnage of 14,000 tons. This is the equivalent of 522 railroad box cars. The ark could have carried over 125,000 sheep-sized animals. Interestingly, there are less than 18,000 species of land animals alive today. Also, the average size of most animals is less than that of a sheep. A scale model of the ark was tested in a special tank at Scripps Institute of Oceanography at La Jolla, California. The tank was capable of generating giant waves with respect to the model boat, thus simulating severe sea conditions. The waves were much larger than would be experienced in the ocean. The ark proved impossible to capsize. Due to the rectangular shape, it proved capable of righting itself, even to 90 degrees. This is unheard of on an ocean-going vessel. Most vessels will develop severe stability problems at more than a 60 degree list. The Ratio of the ark is 30 x 5 x 3. It turns out that this design is a perfect design to prevent capsizing in rough seas. One of the ongoing debates on Noah's Ark is weather the ark was the rectangular design indicated in scripture or a more traditional canoe design. There are still a number of unanswered questions concerning a rectangular "box" design for the ark. The primary concern with this design is longitudinal stability. This problem is associated with the ark's length. Analysis of an all-wood design indicates that the vessel would break apart under heavy sea conditions due to longitudinal forces acting upon it. Further analysis needs to be done on this design. It is entirely possible that the antediluvians had developed methods of construction which we are unfamiliar with. Also, the general shape of the ark could appear to be rectangular, yet curved in areas to relieve stress. Just as the design of modern ships has significantly changed in recent years, the construction of Noah's Ark could turn out to be radically different by our design standards.